Surrounded by miles of beautiful beaches, when residents of the state of Florida decided to choose one type of mollusk as it’s state shell, I imagine that it was difficult. But in 1969 the Horse Conch won the title. The shell is found in the waters all around Florida and can grow to be very large. It can be up to two feet in length and the animal living inside is bright orange. It is the largest snail living in North America so I imagine that is the reason the Horse Conch won the title. I have an old photo of my son, when he was only about 4 years old, holding a large shell that we found while out boating on the Indian River (Intracoastal Waterway) in Florida. We had stopped at a beach area on one of the many little islands and found this huge, dark colored shell. Back in those days, I didn’t know anything about shells, but I did get a picture. One day I will dig it out, but I’m thinking it may have been a horse conch because of it’s size. 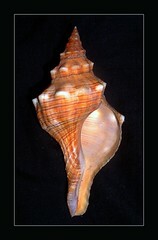 The living horse conch has a dark brown coating on it’s shell and juvenile horse conchs are a light yellow-gold color. Living shells, found in the wild, will most likely have a much different appearance than the shells you see in pictures after they have been cleaned. Knowing the basic shape of a shell or some other characteristics – other than color – may help you identify what you have found.